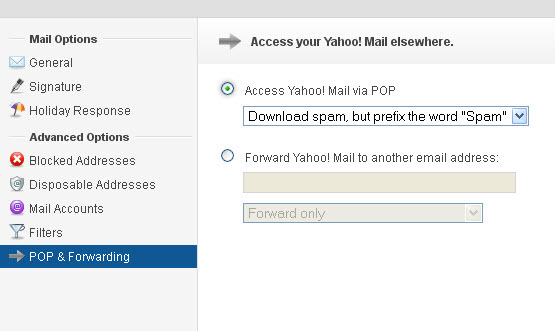 Yahoo allows access to your email using the POP3 and IMAP4 protocols which are standard protocols on most email clients. This tutorial illustrates the setup using outlook express, but the configuration is similar on other clients like windows live mail and outlook. You first need to decide on what protocol you will use to access your mailbox. IMAP4 is the preferred choice because it leaves email on the server. This means that the email can be accessed by other devices e.g. your mobile phone. From the Add menu, click Mail. In the text box labelled Display Name, type your name and click Next. In the Email Address and the reply address box , type your Yahoo! Mail address (be sure to include @yahoo.com) and click Next. 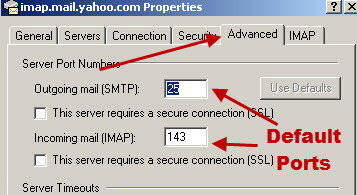 Type imap.mail.yahoo.com in the Incoming Mail (POP3, IMAP4, or HTTP) Server box. 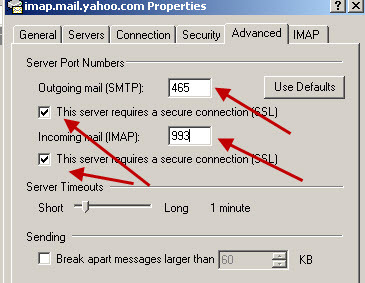 Type smtp.mail.yahoo.com in the Outgoing Mail (SMTP) Server box. In the Account Name box, type your Yahoo! Mail ID (your email address with the @yahoo.com). Check the Remember password box. Click on the servers tab and check the box My server requires authentication and click Apply. 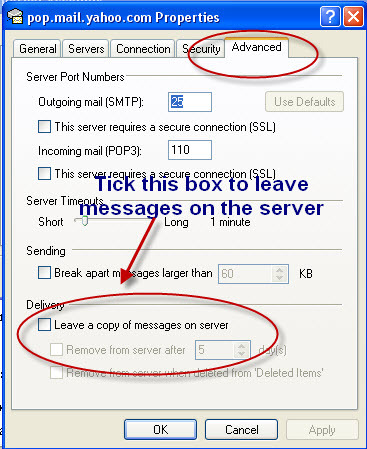 Click on the Advanced Tab and you should see the IMAP and SMTP Port settings which are the default settings. Check the This server requires a secure connection for both SMTP and IMAP4 and change the port numbers to the valuess shown earlier. Password – Your account’s password. Under My incoming mail server is a… select POP3. 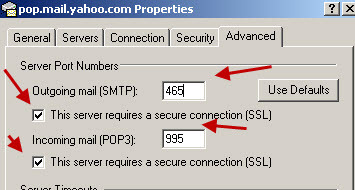 Type POP.mail.yahoo.com in the Incoming Mail (POP3, IMAP4, or HTTP) Server box. If you want Outlook Express to remember your password, check the Remember password box. Highlight the account in the Internet accounts window and click properties to edit the account. 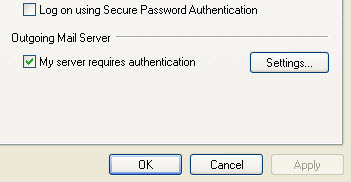 On the Servers tab enable My server requires authentication and click Apply. Change the port numbers to those given above. 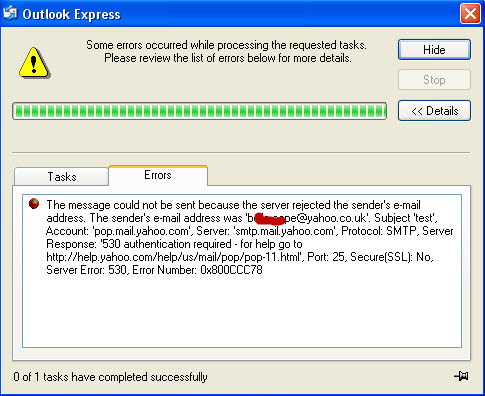 Note:Before you connect outlook express to your yahoo mailbox you should be aware that the default behaviour of the POP3 protocol is to move the messages from your email server (yahoo mailbox) to your email client. 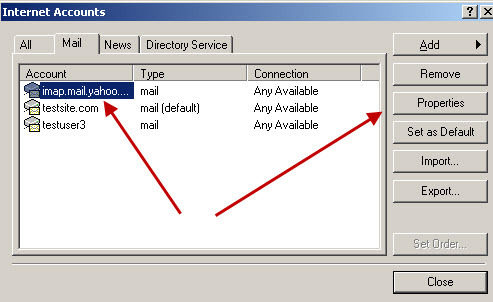 If you leave the client set for this then after you connect outlook express to your Yahoo mailbox the email will no longer be visible when you connect to your yahoo mailbox with your web browser. If you want the email to be available to both outlook express client and the standard web browser then you need to leave a copy of the email on the server. You find this settings under the advanced tab. I recommend that you setup your client before you enable access to your yahoo email. 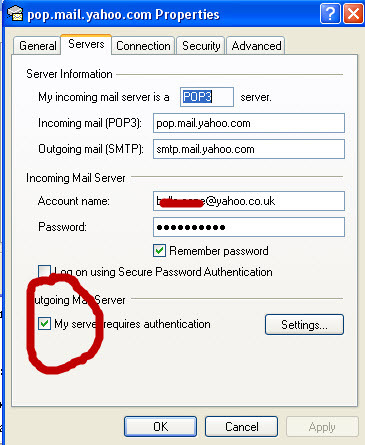 In order to access Yahoo email with POP3 you need to have enabled POP3 access to your Yahoo mailbox. Done: Now you should be able to send and receive email using Outlook Express, and your Yahoo email address/account. You are using the correct Port numbers. Check you are using SSL. It is because you forgot to enable SMTP authentication.